Before any attack on Iran, there may be a military coup in Turkey? Turkey’s government is friendly with Iran and has fallen out with Israel. 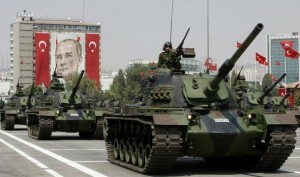 On 1 August 2010, Turkey’s Supreme Military Council held the second day of its annual meeting to discuss promotions and dismissals of officers in the armed forces. The military wants to promote 11 generals who have been charged with plotting to bring down the government. Reportedly, Turkish prime minister Recep Tayyip Erdogan has called for a cancellation of the promotions for the 11 generals. But he lacks the power to cancel appointments wanted by the generals. Abdullah Gul, the president, does have that power because Military Council decisions become law only after being signed by the president. In the past, no president has dared veto the military’s plans. Reportedly, Gul has asked the military not to go ahead with the promotions, hinting that he would not sign the Yas documents if the 11 generals were promoted. A Turkish court recently issued arrest warrants for the 11 generals and 91 other serving and retired officers, with dozens of generals among them. They are to stand trial in December 2010 for their suspected participation in a plan, code-named Sledgehammer. Allegedly, Sledgehammer was hatched in 2003 and called for a coup against the government of Mr Erdogan. According to the prosecution, the plotters planned to bomb a mosque in Istanbul and to provoke tensions with Greece in an effort to cause unrest and prepare the ground for a military coup. Only one of the 102 suspects has been arrested so far. The others have appealed against their arrest warrants. Some officers, including retired high-ranking generals, are standing trial as suspected members of Ergenekon, a fascist group with links to the CIA and Mossad. Constitutional amendments designed to curb the generals’ political influence will be put to a referendum in September 2010. The government is struggling to deal with a fresh wave of attacks by Kurdish rebels, who are said to be backed by Ergenekon, the CIA and Mossad.